Life can be stressful, which is why most people enjoy a relaxing, rejuvenating soak in the tub. However, it can be difficult for people with limited mobility - such as disabled people and seniors - to get in and out of the bath. What should be a relaxing ritual often becomes a monumental effort, due to the difficulty and the presence of so many slip and fall hazards. If you have safety concerns related to slipping and falling in your Hamilton home bathroom, it may be time to speak to a trained consultant at Safe Bathing Canada about your options. Safe Bathing Canada is a leading reseller and installer of safety bathtubs to residents in Hamilton and across the country. We can help you find the perfect safety bathtub to meet your needs. Low threshold entry: While using a standard bathtub requires you to step over an edge measuring between 12-15" high, a safety bathtub from Safe Bathing Canada has a low 3-5" step, thanks to the handy side door, which opens inwards, outwards or by sliding up and down. Lever handles: The twist design of standard faucets can be difficult to operate for people who suffer from painful hands, limited mobility, and arthritis. Our walk in tubs have lever handles that can easily be opened and closed. In-line heater: Your comfort is our priority, which is why our safety tubs are equipped with an in-line heater to regulate the temperature of your water. This will ensure that you remain comfortable throughout the bathing experience. Call Safe Bathing Canada today to perform a free assessment in your Hamilton home. Our consultants are expertly trained to provide expert advice - no pressure! They will take measurements, discuss your specific needs and provide recommendations based on what's right for you. Afterwards, they will provide a free quote on your new walk-in tub. 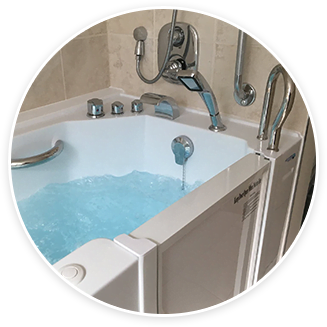 When you decide to go ahead with the installation, you can rely on our expert installation teams to complete your safety tub in no time. Call us on 1-844-400-SAFE(7233) today to book a free consultation!